Copper Kitchen – The right sauce for the job. The right sauce for the Job. Experience the fun and exciting “sweet” yet “spicy” flavor of Copper Kitchen’s Finishing Sauce. Brush on to chicken, beef, poultry, pork, fish and vegetables at the end of the cooking process, or when food comes hot off the grill. A perfect finish on ribs! 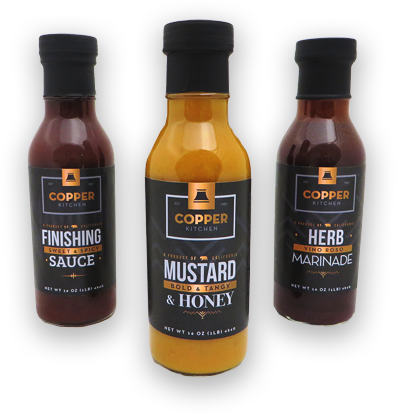 Originally created for grilling, use Copper Kitchen’s Finishing Sauce when baking as well. Add to your favorite meatloaf recipe in place of ketchup or as a glaze on baked ham. You can find some of our favorite recipes here. 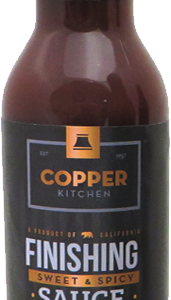 There are ideas for using Copper Kitchen’s Finishing Sauce when preparing main courses, appetizers, or even desserts.